Apple’s mobile operating system, iOS 11, has been out since September. In the three months since its release, 59 percent of active iOS devices have adopted it. The Cupertino, California-based company frequently updates the number of devices on its OS based on App Store data, and the latest numbers as of December 4 claim that 59 percent of active iOS devices run some version of iOS 11. 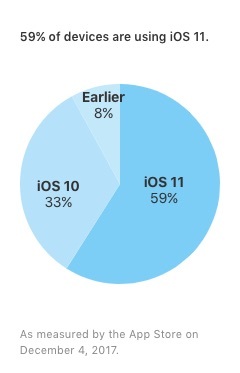 As for iOS 10, 33 percent of devices run the operating system, while eight percent of active devices are using an even earlier version. It’s great news for Apple, as more than half of devices are staying on its most up-to-date software only two months after launching it. Apple first unveiled iOS 11, the latest and greatest version of its smartphone and iPad OS, at its 28th annual Worldwide Developers Conference. The final version of iOS 11 is currently available for download on all 64-bit iPhone and iPad devices and apps. But any 32-bit devices like the iPhone 5C and the iPad Mini are not compatible. With iOS 11, users see incremental changes ranging from a redesigned Control Center and notifications, along with additional photo effects akin to Live Photos. As far as new features go, Apple introduced peer-to-peer transactions with Apple Pay, and Files — a new file management system. The update also includes ARKit, which will allow developers to build or bring fluid augmented reality apps to iOS. The App Store also looks drastically different from the update as well. It showcases apps in ways that are more recognizable, such as editors’ choices, top picks, and reviews to help navigate based on user experience and popularity. The new “Today” tab refreshes each day, highlighting games and apps of the day while also featuring original stories from Apple’s editors. Apple maintains tight control over its operating system and hardware, which allows the company to see high adoption rates of its latest software. Google’s Android version updates, on the other hand, have to be released by a myriad of manufacturers and then by carriers if the device is locked. Update: We’ve added the latest metrics from Apple.